Published: Sept. 15, 2016 at 07:33 p.m. Updated: Sept. 15, 2016 at 08:02 p.m. Here we'll look where cornerbacks and wide receivers line up, which defenses are particularly susceptible to which player packages and so much more in order to find value with our fantasy players. As the season goes along we'll have even more data to use and a better understanding of the Next Gen Stats. Here are the top matchups that could bring value in Week 2. The hope was that the return of Jordy Nelson would bring stability back to the Packers offense and the unit as a whole would have to rely less on "hero-ball" from Aaron Rodgers. In the first few weeks of the 2015 season the Packers offense still put up points thanks to Rodgers' always present improvisational ability, but when teams adjusted and were able to keep them on a traditional script, the unit had no punch. At least in Week 1, there wasn't a discernable difference between the amount of improvisation Aaron Rodgers was asked to perform from last season. Rodgers threw 26.5 percent of his 34 passes from outside the pocket, the second-highest rate among quarterbacks in Week 1. This was actually up from an average of 18 percent during the 2015 season. One of the biggest downfalls of Green Bay's scoring units in 2015 was the wide receiver corps lack of ability to quickly separate from man coverage. Once again, that appeared to be an issue on Sunday. Rodgers had the second-longest time to throw among quarterbacks in week one with an average of 2.9 seconds. He recorded a time to throw of 5.3 and 4.4 seconds on his touchdown passes to Jordy Nelson and Davante Adams, respectively. Those were the two longest time to throws of all touchdown passes in Week 1. Even with Jordy Nelson on the field the plays still aren't developing as intended just yet. He only played 84 percent of the snaps and averaged just 5.3 yards per reception, clearly not the game-changer they need, for now. Of course, Rodgers is still good enough to make this offense a 25-plus point scoring unit, as he showed on Sunday. However, as Alex Gelhar noted Rodgers has a semi-dubious history against Mike Zimmer's defense. With the Packers still needing to rely on his super hero acrobatics to put up points, this could be a down week for the Green Bay scoring unit. The Packers offense is one of the most talent-laden units in the NFL, they could bust out any week now. However, at the moment, they clearly aren't quite back to that level just yet. We need to see a bit more evidence before approaching them as the sort of record-breaking unit they could be. Exciting second-year wide receiver Amari Cooper started off his 2016 campaign with a bang, snaring six receptions for 137 yards against the Saints' woeful secondary. He was all over the field for the Raiders in Week 1, slicing through the New Orleans secondary to the tune of 35.08 yards of distance recorded per play, the most of any Oakland pass-catcher. More importantly, he usurped the target lead spot from veteran Michael Crabtree, recording 11 to Crabtree's eight and playing four more snaps. Cooper is in an elite spot once again this week as the Raiders welcome the Atlanta Falcons for their home opener. Desmond Trufant is one of the best cornerbacks in the NFL, but unlike players like Patrick Peterson or Darrelle Revis, he's not a shadow corner. Much like Richard Sherman, Trufant sticks to the left side of the defense more often than not. In Week 1, he took all but two plays from the defensive left side of the field. On the other hand, the Raiders move Cooper all over the field. In Week 1 he took 43 percent of his snaps at left wide receiver, 43 percent at right wide and 14 percent from the slot. If the Raiders employ something close to this plan with Cooper again, he could conceivably run at least 57 percent of his routes away from Trufant's side of the field. Mike Evans illustrated that last week, as he went for 99 yards and a score against the Falcons. Of that production, 55 percent of his yards came from the left wide receiver position while the other 45 percent of his yardage and his score came from the slot. 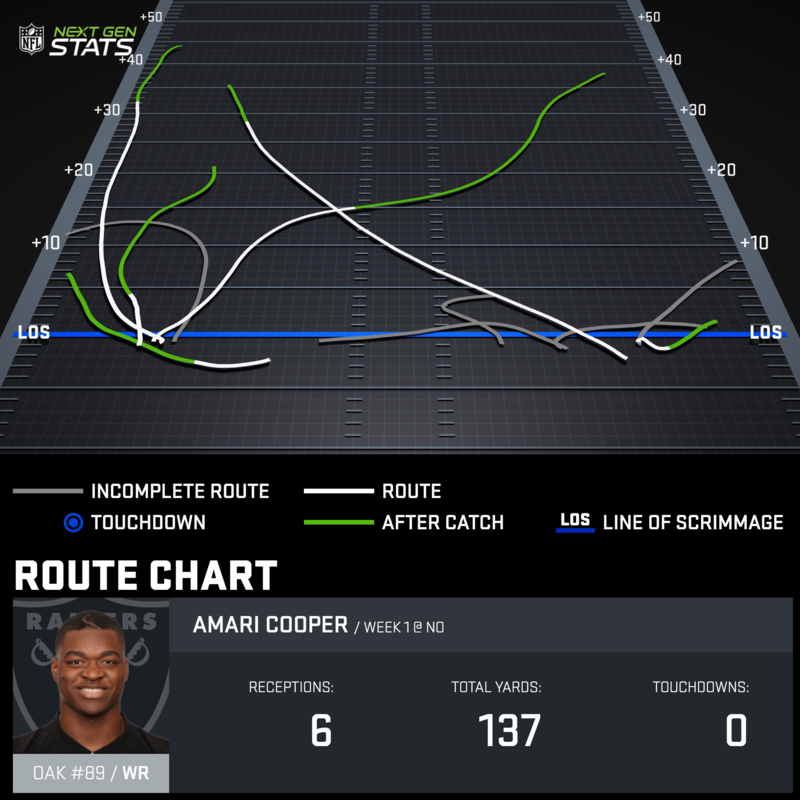 As his Next Gen Stats route chart shows, Derek Carr hit Cooper on multiple deep passes and the receiver created a ton of yardage after the catch. Cooper's five incomplete targets were on four shorter routes and another intermediate out. If Carr and Cooper connect on more routes of that variety, especially on those he runs away from Trufant's side of the field, then the second-year Raiders receiver could be in for a monster outing in his 2016 home stadium debut. The fear of Bill Belichick's apparent preference to "play games" with his running backs constantly has people in fear of rolling out LeGarrette Blount on their fantasy teams. However, as FantasyGuru.com Senior Analyst Graham Barfield points out, Blount has an RB2 floor in games where the Patriots face inferior teams. Since 2013 he has almost double the yards and carries against inferior teams, while scoring on average .68 touchdowns and 11.5 PPR fantasy points compared to .21 and 8.08 in games that don't fit into those qualifications. The Patriots Week 2 home contest with the Miami Dolphins certainly looks like a game where Blount has direct access to that floor that Barfield outlines. However, the on-field matchup indicates this could be a week where Blount hits a much higher ceiling. The Miami defensive ends lined up in the Wide-Nine with frequency in Week 1 and we should expect them to do so throughout the season. While this formation certainly makes life difficult for passing offenses and can give the defensive ends an advantage in pass rush situations, it makes them painfully susceptible to the power run game between the tackles. Enter LeGarrette Blount, who was already in a strong position to get a ton of work given the likely game script. 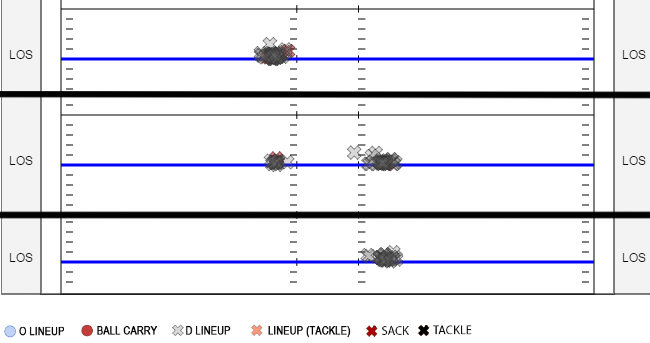 A noted schematic wizard, Bill Belichick will almost certainly install a heavy dose of power running with Blount once he identifies this weak point in Miami's defense. Blount should have all the gaps he needs to blow through the interior or Miami's defensive line. When he gets to the second level, Blount is notoriously difficult to bring down. The Dolphins have a light linebacking corps, led by Kiko Alonso who traveled an average of over 20 yards of distance on solo tackles in Week 1. Blount should be able to truck through this linebacker group and into the open field, where he is most dangerous. This is both a poor personnel and schematic matchup for the Dolphins. The Patriots already showed their hand in Week 1 by giving Blount 22 carries in a game where he typically wouldn't be a factor -- the Cardinals are in the Patriots class of team quality and feature a heavy defensive front. Clearly, they want the big power back to be a sustaining force while Jimmy Garopplo is the starter in place of Tom Brady. Now at home and against the Dolphins, Blount has the advantage over the defensive front he's set to face to turn those 22 carries into a big game and possible top-10 fantasy running back finish this week. The Bears wide receivers have an advantageous matchup on their hands in Week 2 as they'll welcome the Eagles to Soldier Field on Monday night. Starting left cornerback Leodis McKelvin is likely to miss the game with a hamstring injury, forcing seventh-round rookie Jalen Mills into the starting lineup. To make matters worse, starting right corner Nolan Carroll gave up multiple big plays in Week 1. Robert Griffin III targeted Carroll six times and he allowed three receptions for 114 yards. The most notable play was a 44-yard reception given up to Terrelle Pryor. Carroll had solid coverage on the play but Pryor, who has a three-inch and 18-pound advantage, out-worked him at the catch point. Both of the Bears receivers will have the same trump card to hold over Carroll, as both Alshon Jeffery and Kevin White are listed at 6-foot-3 and over 215 pounds. Jeffery took the majority of his snaps (45 percent) at left wide receiver on Sunday. If he does so again, he'll likely run the majority of his routes against Nolan Carroll. Expect Jay Cutler to test the Eagles defense down the field after they showed some weakness there in the opening contest. 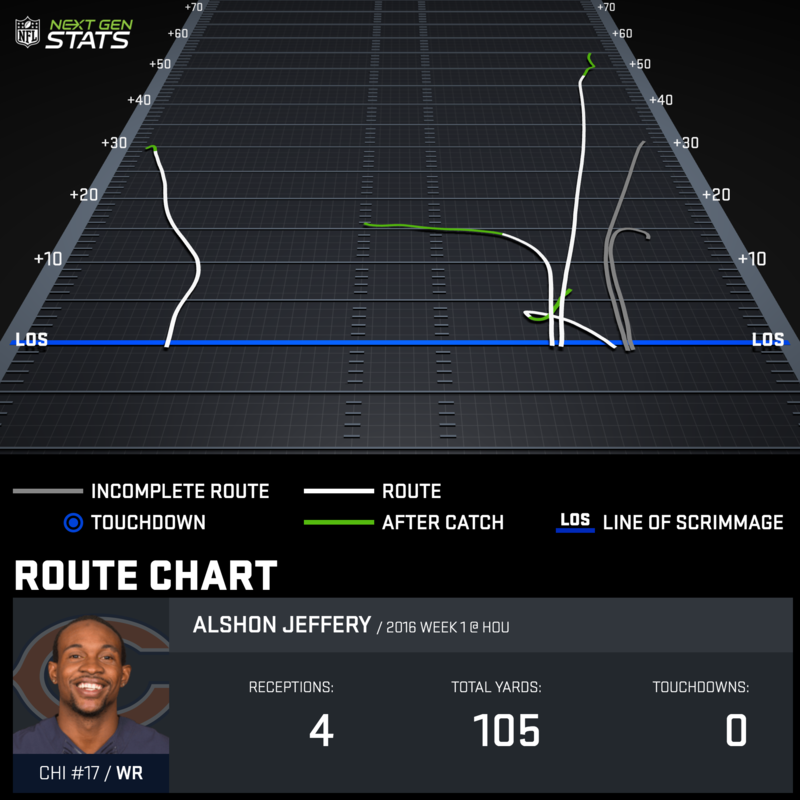 With this matchup squarely in his favor, Alshon Jeffery has the top-scoring WR1 overall in his range of outcomes this week. Additionally, this will give us a good chance to watch Kevin White in a more favorable spot than he faced last week against Houston's stick cornerbacks. White actually out-targeted (seven to six) and out-snapped (98 to 95 percent) Jeffery in Week 1. That at least provides some clue that the Bears coaching staff still has faith in White after a rough preseason. While it certainly won't feel comfortable rolling Kevin White as a fantasy starter, and that would qualify as a bold move, don't be surprised if he returns strong production in Week 2. Even if you can't stomach playing him just yet, use this as a chance to monitor whether he can take advantage of a favorable spot. Torrey Smith took more snaps at right wide receiver than any other player in Week 1 with a whopping 91 percent of his 71 plays coming there. If that hold ups for Sunday's road trip to face off with the Carolina Panthers, Smith will be the 49ers receiver with the most favorable cornerback matchup. The 49ers made Jeremy Kerley the featured receiver in Monday night's game plan against the Los Angeles Rams, picking on the interior of their defense. Kerley is primarily a slot receiver, taking 82 percent of his snaps there in Week 1. While he held a clear advantage over the Rams' defense he won't have that against Carolina. The Panthers most established corner, Bene Benwikere often shifts into the slot when the offense rolls out three wide receivers. He's a solid player and the Broncos avoided him in Week 1. Of Panthers corners who were on the field for more than five pass plays, Benwikere came out with the lowest target rate on his coverage attempts of just 12.5 percent. On the other hand, Smith should run the majority of his routes against rookie corner James Bradberry, who primarily played the defensive left side in Week 1. Smith couldn't get much down in Week 1 against the Rams' top corner, Trumaine Johnson, but has a much better matchup on his hands this week. The 49ers will also be in a much more pass-heavy game script as they will likely fall behind to Carolina early in the contest. It's hard and quite possibly not advisable to trust Smith this week, but he is in play as a deep-league option and a potential daily fantasy contrarian move. Rather quietly, Damarious Randall was one of the better cornerbacks in Week 1. Randall covered Allen Robinson more than any other Packers corner (13 of 27 pass plays) and gave up only one catch for four yards to the stud wideout. Overall, Blake Bortles targeted Randall seven times and the Packers corner let up just two catches for 13 yards overall and a passer rating of 39.5. He finished second among cornerbacks who played more than five snaps with a catch rate allowed of just 28.6. Randall will get another tough test in Week 2 when the Packers travel to Minnesota to take on the Vikings in the opener of their new stadium. The Vikings have one of the best young receivers in the NFL in second-year player Stefon Diggs. 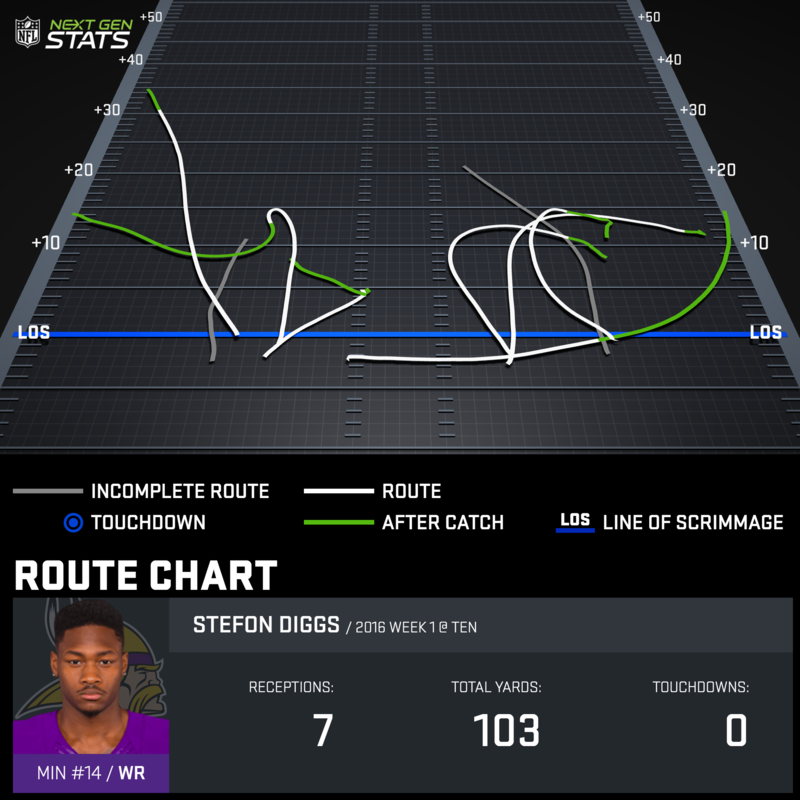 You see here Diggs runs a variety of routes: the comeback, go-route, out and even a pattern out of the backfield. You also notice that he was deployed all across the formation on Sunday. Diggs took 69 percent of his snaps out wide, 27 percent in the slot and even four percent tight to the line. If Diggs moves around again he should avoid Damarious Randall's coverage for a good amount of his routes. Randall lined up at the left corner position against the Jaguars in Week 1 and Diggs took just 38 percent of his snaps at right wide receiver. Diggs should be able to get his in other formations and should prove a fine test for a corner who showed out in the opening week of the season. The Vikings will need to throw to keep up with the Packers, so Diggs should see a healthy target volume once again. Either way, this will be a fun matchup between two sneaky young stars in the NFL, even if they won't square off on the majority of their plays. No player saw more passing targets than Allen Robinson in Week 1 of the NFL season, as the Jaguars Pro Bowler garnered 15 against the Packers. That's more than he saw in any game during the 2015 NFL season when he went for 1,400 yards and 14 touchdowns. It looks like the regression concerns regarding Robinson's opportunities in 2016 were indeed unwarranted. 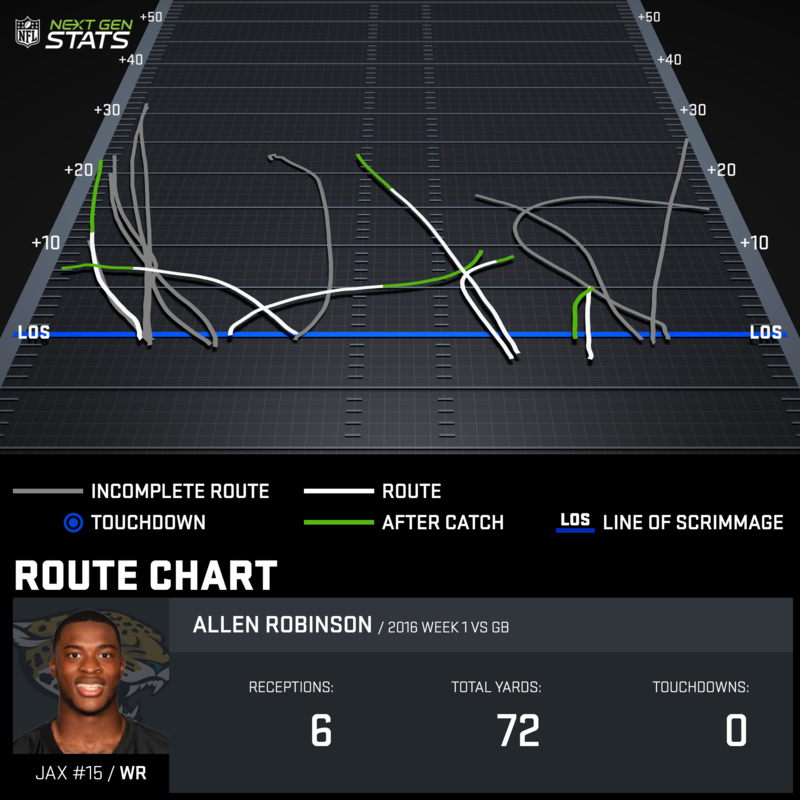 You can see in his Next Gen Stats route chart that Robinson made good in converting on a number of his short patterns in Week 1, but the deep plays didn't come through. Watching the film you can see that Blake Bortles either just missed him or the Packers coverage players did just enough to break up the catch point. Expect a few of those to go back the other way on Sunday, as no receiver was better at converting downfield routes into receptions than Allen Robinson in 2015. Jason Verrett had a solid game against Jeremy Maclin in Week 1 holding him to just five catches, but he also gave up a 19-yard touchdown, his first allowed to a Chiefs' wideout in three games. Robinson took his route-running craft to the next level this offseason, and that's the strength of Maclin's game, as well. Verrett is a strong test for Robinson, but one that he's certainly capable of passing. The Chargers and Jaguars are likely to get into a shootout on Sunday, and another 15-target game could foretell an Allen Robinson explosion game. Look for the Jaguars to do everything they can to get Robinson free from Verrett's coverage. They already lined him up in the slot on 27 percent of his snaps in Week 1. The signs here are pointing to a big game from Robinson in Week 2.